Wow, what a game. Well worth the price we paid for the trip. 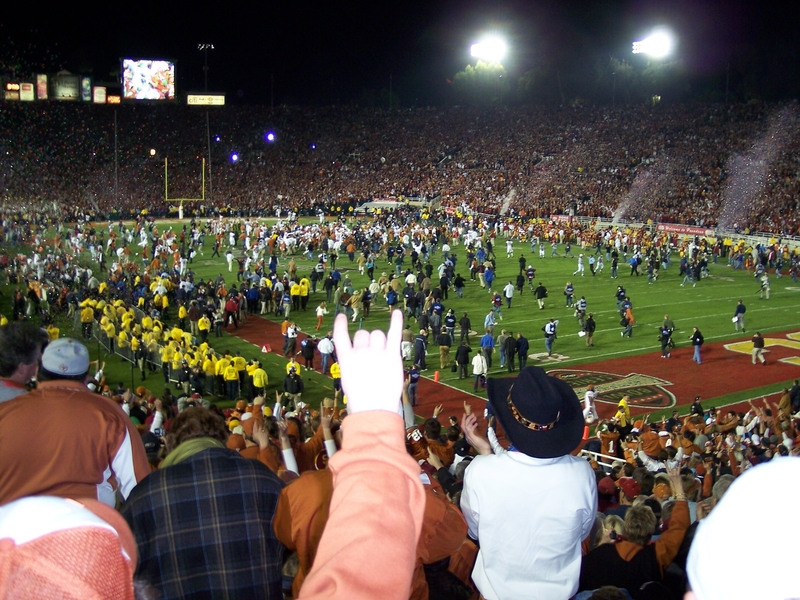 To be there in person for the Longhorns’ coming back from a 12 point deficit and winning the National Championship is priceless. Frenchville will be burnt orange for some time. 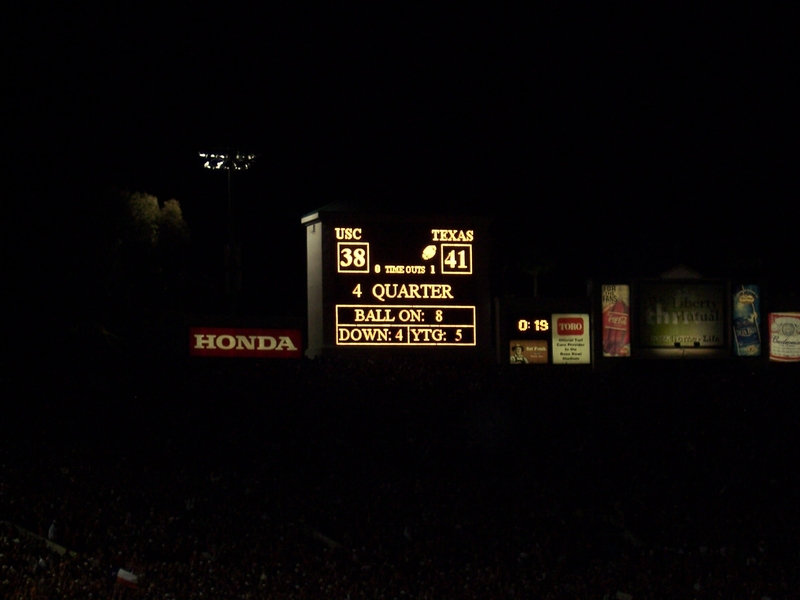 I was feeling a little bleak when Reggie Bush scored that touchdown to go up by 12. 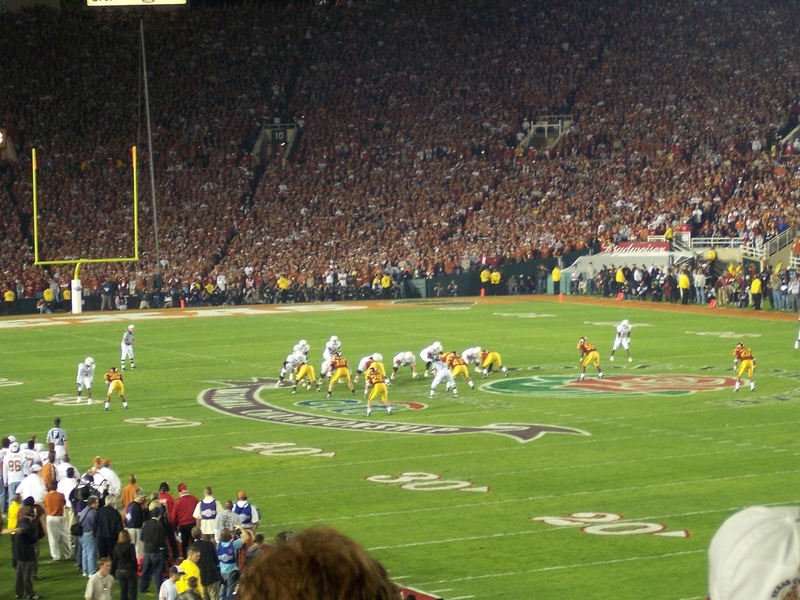 But Vince Young showed everyone how good he really is. 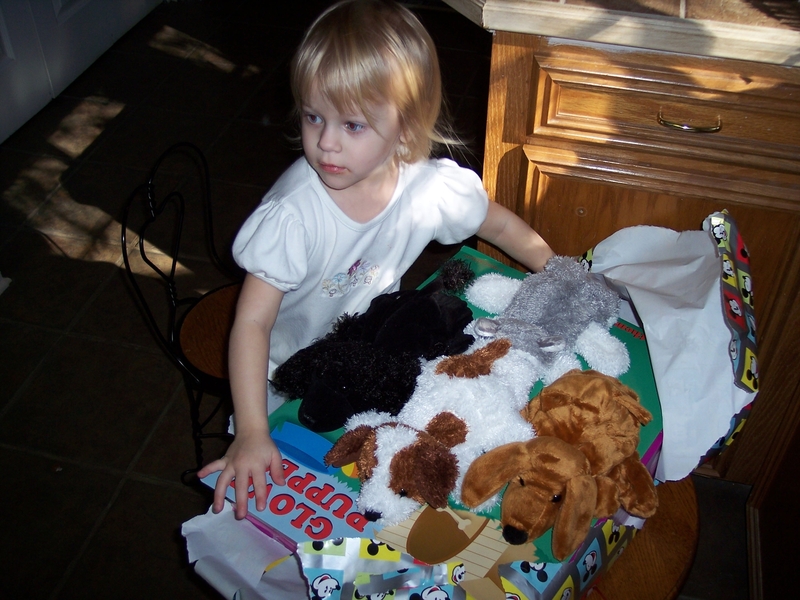 His passing was spot on and his scrambling ability was amazing. To see him in person and how fast he moves on the field, it’s so different from seeing it on TV. On the last score he ran into the end zone right where we were sitting. I saw it opening up and he was running right through where I thought he should go. Everyone in the stands erupted and were all jumping around. It was amazing. 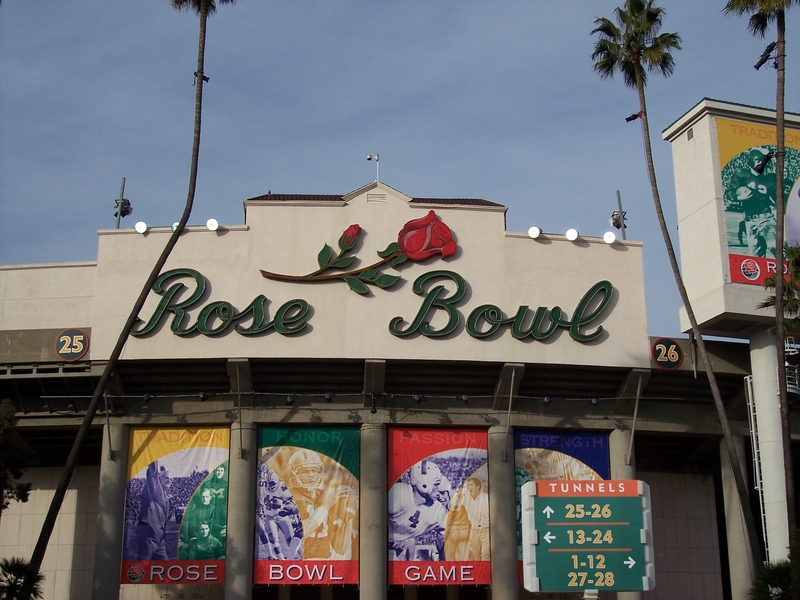 Why couldn’t the Rose Parade have been today? 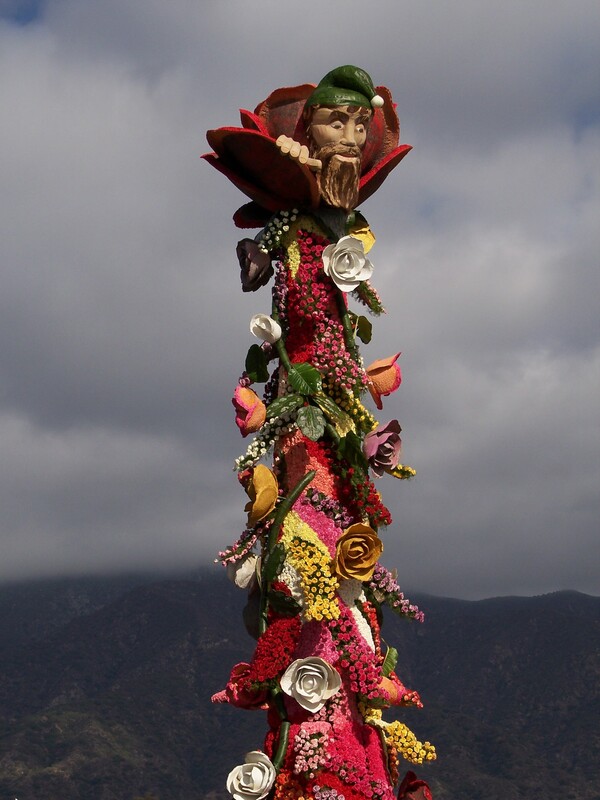 It was nice and sunny so we decided to go view the floats up close. We skipped it yesterday because of the rain. So, we walked quite a distance down to a Park N’ Ride for the post parade viewing of the floats and rode a bus to where the floats were. It was nice seeing the floats up close. They weren’t in as bad shape as I thought they would be, but you could still see quite a bit of rain damage. In the evening we rode with the six elderly University of Texas nurses, who we met on our first day at the hotel, to the Longhorn Bash. 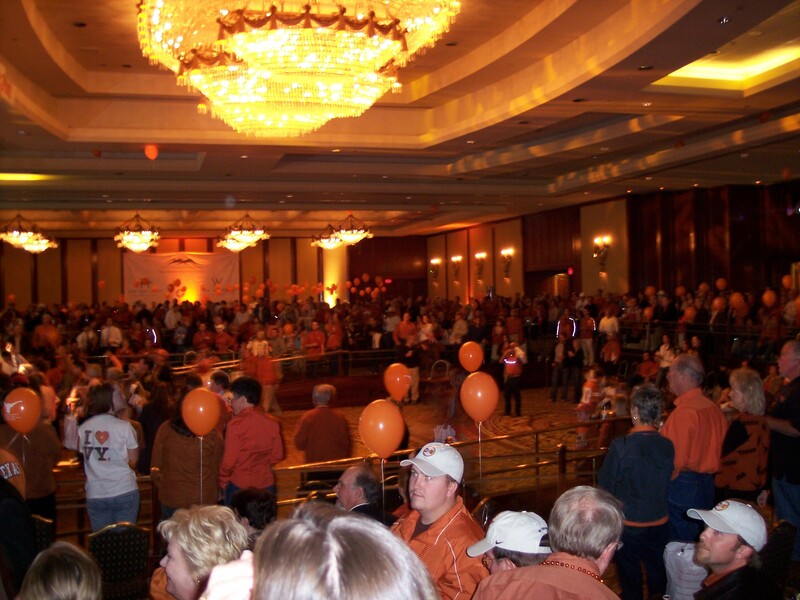 It was a gathering of 7,000 Longhorn fans in Los Angeles at the Century Plaza Hotel. There was beer, BBQ, and bands playing music. Bevo and the cheerleaders showed up and lead Texas cheers with the whole group. Jennifer said that she’d never seen such a sea of orange. 51 years without any rain and today it down poured. 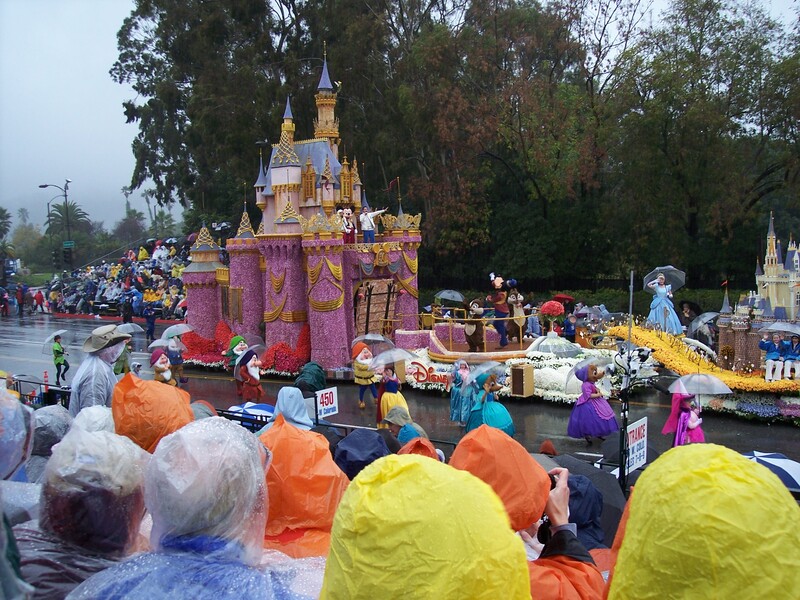 Today was the 117th version of the Rose Parade and we sat through the cold and the rain to see most of the parade. We left about 15 minutes before the end so that we could beat the crowds out of there. 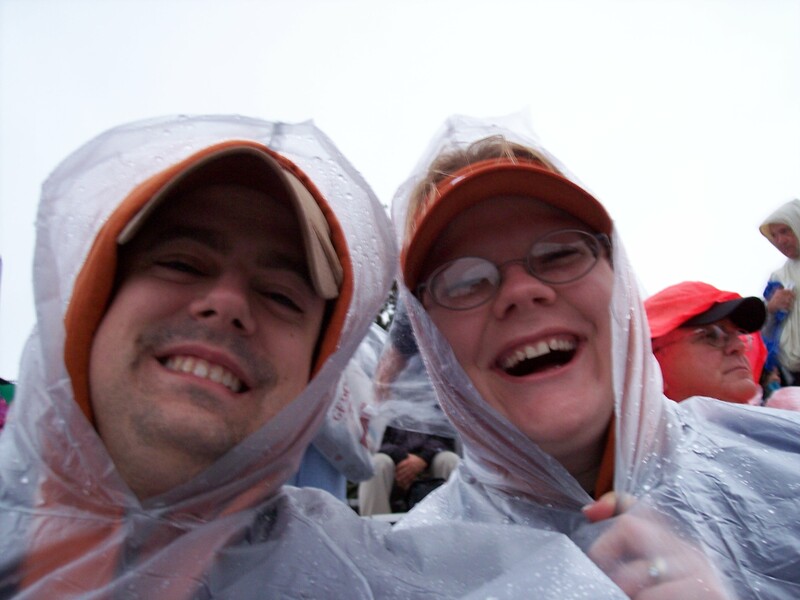 We had rain slickers (thanks to Aunt Marci), but as we sat there, rain was still getting though. We were soaked from the legs down. This combined with the cold wind that was coming up through the grandstands made it a pretty rough ride. We were supposed to have lunch at a restaurant near the parade route, but we were soaked and we decided to walk back to the hotel. We were pretty pissed at the tour guides for not taking us back to the hotel before lunch. Who wants to eat lunch in soaked clothing. After lunch we were supposed to go see the floats, but we decided to skip that as well. Since we had the afternoon off, we walked across the street to a movie theatre. It’s been a while since we’ve seen a movie. 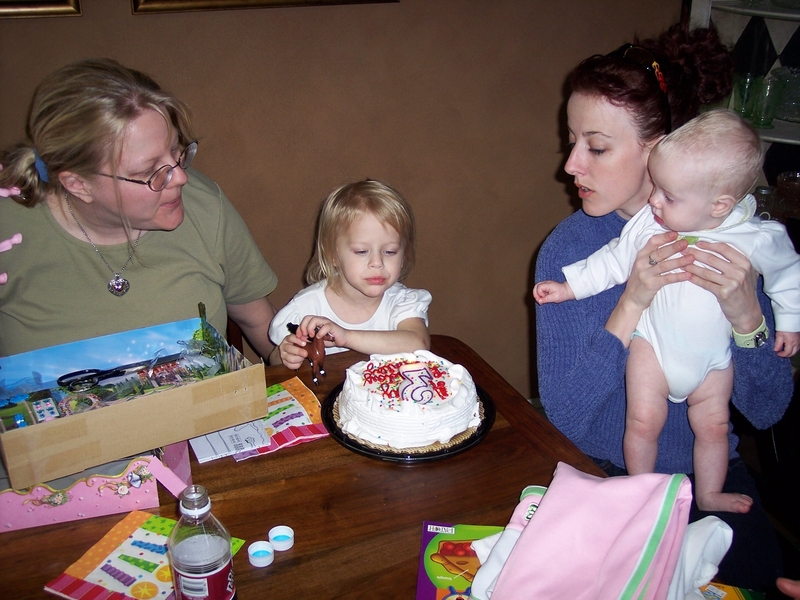 The last one we saw was Pooh’s Heffalump Movie a year ago with the girls before Isabelle was born, which is pretty sad. We went to see Cheaper by the Dozen 2. It was a cute movie and passed the time until dinner.